Brows are one of the first things that I look at when I see someones face. I love a nicely groomed brow. I admire those perfectly sculpted brows on the likes of Chrisspy, Desi, Shirley B. Eniang… But I just haven’t got the patience to paint my brows on perfectly every day. I’m a get up and go kind of girl. Luckily I have quite full brows so I don’t have to do too much filling in. However, I do like to even out any gaps and darken them so that they really frame my face. 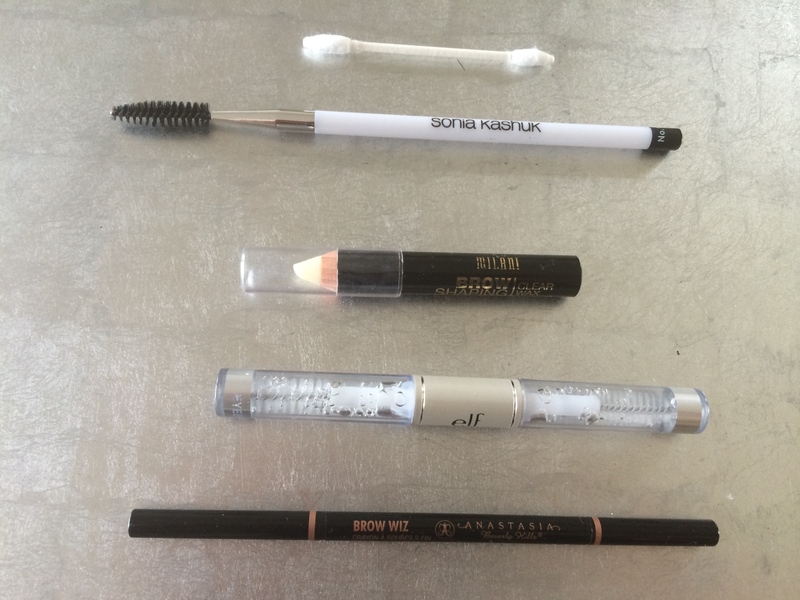 These are my brow saviour products that I could not live without. I always give my unruly brows a nice brush through before filling them in. I like the Sonia Kashuk No.127 brush, but Elf also do a great one for only £1.95. I use the Milani brow shaping clear wax first to give my brows some texture and help them to stay in place. Unfortunately you can’t buy Milani in the UK, but the L’oreal super liner brow artist eyebrow pencil has a clear wax on one end which is basically the same thing. Tati said this is a good alternative to the pricey Anastasia equivalent. I have spent years using eyebrow pencils from affordable brands like the L’oreal one mentioned above and the Rimmel Professional eyebrow pencil. But now I have tried the Anastasia Brow Wiz, I AM NEVER GOING BACK! It is the ultimate brow pencil. It’s fine tip makes it easy to use and the twist up design means no need to sharpen. There’s also a handy spoolie on one end, although I like to use a separate one so that I can wash it. I have it in the colour EBONY, which is a perfect match for my very dark brown hair. It’s available at Sephora or on Cult Beauty if you’re in the UK. Yes it is pricey but worth every penny. I love this product so much that I have written a whole post on it. Check it out here. I run this through my brows after filling them in to fix them into place. On a lazy day I will just use this to keep my brows looking tidy. Sometimes I’m a bit messy so I like to clean my brows up with a cotton bud. I like the Q-tips precision tip ones as they have a pointy tip. Boots also do some with one pointy end. And TADAH the perfect brow is created! I would love to try the Anastasia Dipbrow pomade too and attempt that flawless perfect brow. What are your brow saviours?